A Nova Scotia family is shaken after a car smashed into the side of their home, causing extensive damage to the house. Tonya Ward and her family were waking up early Saturday morning when she said they heard a “big boom” from the side of the home. "It sounded like an earthquake had happened [with] the rumbling and the glass smashing,” she told CTV Atlantic. “We instantly jumped out of bed to see what had happened. We actually originally thought the big tree had fallen into the house." 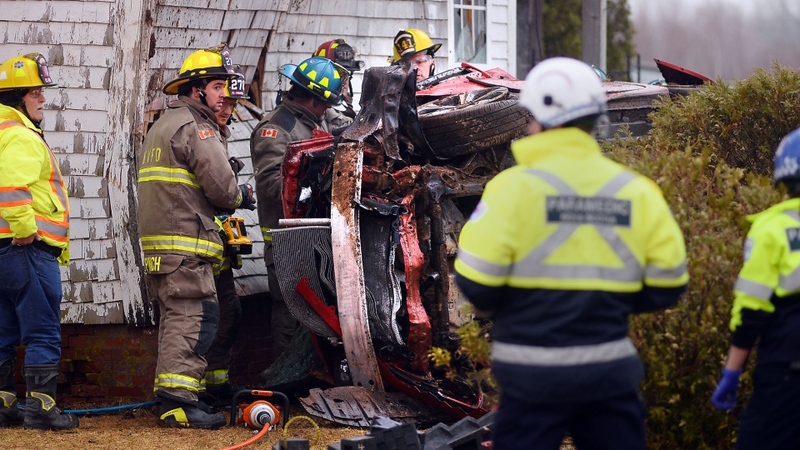 Shortly after 7:30 a.m., a car drove off the road, flipped in the air and hit a tree before crashing into the house, Kentville Deputy Fire Chief Scott Hamilton said. The crash caused extensive damage to the house and scattered debris around the yard. The car smashed directly into Ward’s grandmother’s bedroom and trapped her inside. Her grandmother was taken to hospital and remarkably suffered no injuries. The car’s passengers were also taken to hospital with undetermined injuries. They have since been released. It is unclear what had led to the crash or if charges will be laid against the driver. The RCMP is investigating. The house has been in Ward’s family for more than 50 years and it was Ward’s “childhood dream” to own the property. She lived there with her partner, grandmother, four children and a number of pets. “We've been enjoying living with my grandmother and … now the family is displaced and separated for the time being,” she said. It’s not the first time the house has had a close call with vehicles going off the road, which has a posted speed limit of 80 km/h. In the past 12 months, Hamilton said the fire department has responded to three multi-vehicle collisions where the jaws of life had to be used. "It's definitely an active section of road there that we've responded to,” he said. Ward hopes those changes happen so that another crash like this could be avoided.